Have everything ready and organized for finals! 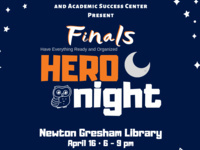 Newton Gresham Library is pulling out all the stops for you to ace your papers and exams this semester. Check in on the second floor near the library service desk and enter to win prizes throughout the night! Academic Success Center writing/STEM tutors and peer mentors will be available for help with assignments, and librarians will be on hand for one-on-one research consultations. The library will open additional computer labs on the first floor and will offer group study space.Free food will be available - first-come, first-serve. Don't miss your chance to be a Finals H.E.R.O. !